At Sports Cards Plus, you always get more! 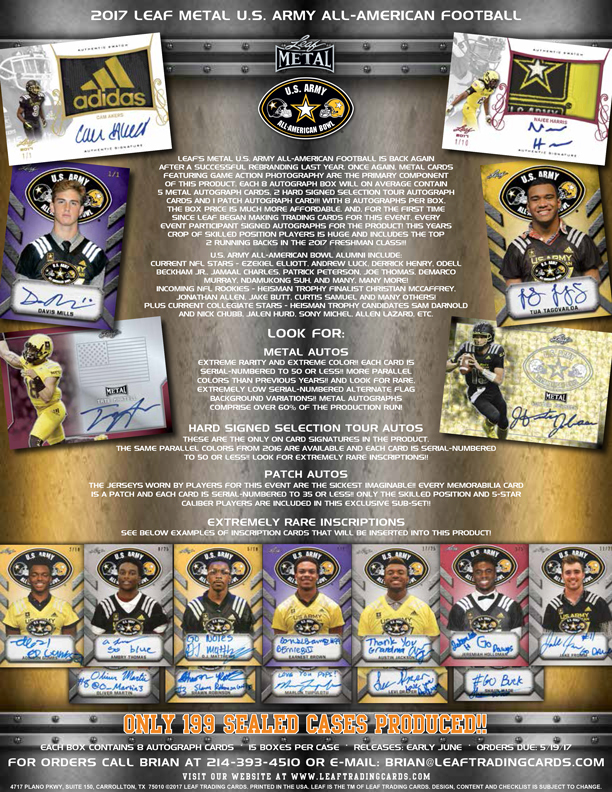 One lucky Sports Cards Plus customer will be a ball boy at The January 2018 U. S. Army Army All-American Bowl Game. and refreshments at half time. Due in Friday is 2017 Leaf U. S. Army All-American Football with 8 Autographs per box for just $69.95. Only 2985 BOXES made! The average eight-card box of 2017 Leaf Metal US Army All-American Football have five Metal Autographs, a pair of Selection Tour Autographs and one Patch Autograph. Click HERE to see cards from previous issues of Leaf Metal U. S. Army All-American Bowl Football.